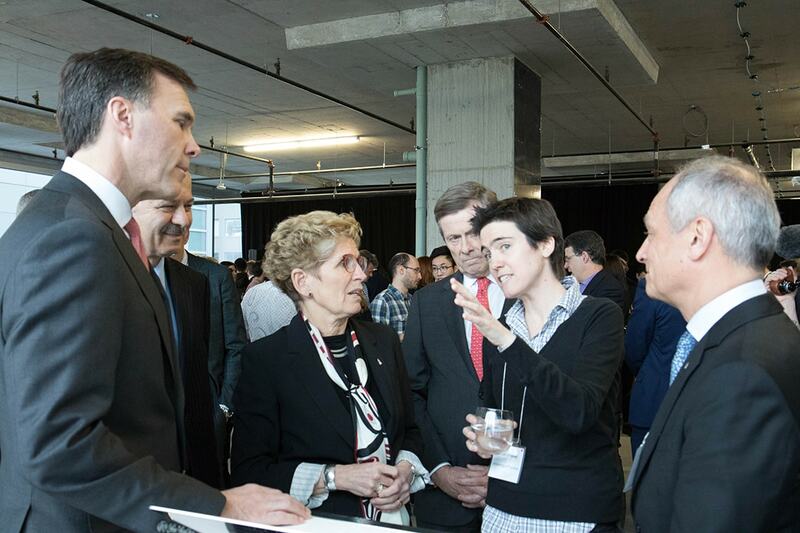 With the creation of the Toronto-based Vector Institute, Ontario and Canada are choosing to lead in the booming field of artificial intelligence, said Ontario Premier Kathleen Wynne today. “We can own this space. This is who we are,” she told a crowded room filled with University of Toronto researchers, officials from all three levels of government and top Canadian companies who are supporting Vector. The independent institute aims to produce more deep learning grads than any other institution in the world – as part of an effort to produce, attract and retain top talent. It will also build on the existing expertise of the globally renowned deep learning team at U of T.
The applications and implications of this ground-breaking research could be seen in demonstrations on self-driving vehicle technology by Raquel Urtasun, a U of T computer science associate professor, as well as U of T startup Deep Genomics. Founded by Professor Brendan Frey of the Edward S. Rogers Sr. Department of Electrical & Computer Engineering, Deep Genomics uses deep learning to predict the molecular effects of genetic variation. In addition to $50 million in provincial support, Vector will also receive $40 million to $50 million as part of the Government of Canada’s Pan-Canadian Artificial Intelligence Strategy, federal Finance Minister Bill Morneau said. The $125-million strategy is also supporting similar institutes in Montreal and Edmonton. More than 30 companies have also committed a combined total of more than $80 million over 10 years to support the Vector Institute, reflecting the transformational potential of deep learning and machine learning in fields as diverse as health care, finance, insurance, education, retail, advanced manufacturing, construction and transportation. Using his time at the podium, Geoffrey Hinton, a U of T University Professor Emeritus in computer science and Vector’s new chief scientific adviser, deviated from the usual prepared remarks to deliver a pithy TED Talk-like PowerPoint on how neural networks and deep learning work.